I can practically smell the music from here. Two more sleeps till those sweet notes fill every leafy nook and shady cranny of Prince's Island Park, two more sleeps till I haul my festival chair and our family tarp to our super-secret (north side near the back amongst that stand of trees) super-optimal main stage location for four days of bliss. Tonight I customized my volunteer shirt. 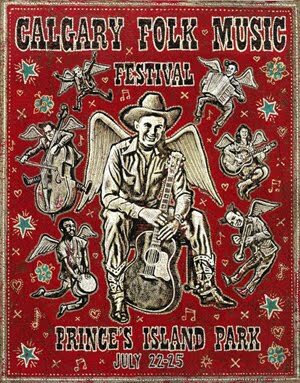 It's purple this year, which was a trifle alarming at first, but it features the same winged cowboy artwork as depicted in the poster, and that just seemed to cry out for some fringing and beadwork. So rather than hack off the sleeves and neckline, as I normally do, thereby converting my volunteer shirt into a folk-flavoured wife-beater, this year I decided to go a little less trashy, a little more retro, and to channel my inner rockabilly folkie instead. A pair of scissors and handful of beads, and I am a fringed splendour. Soon as I locate the camera, I will show you. And hey, if you happen to find yourself in the Calgary folk festival vicinity, you should come hang out with me. I'll be working in the record tent 10-12, 1-5 on Thursday, 2:30-5 on Friday, 9-1 on Saturday, and 10:30-1 on Sunday. Drop by and I will show you where I hid all the best CDs. 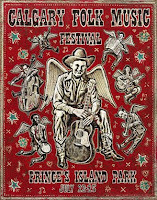 Can't wait to see your folk fest tee! I love when volunteers at events customize their own looks. Nice schedule. Although I'd be skipping Michael Franti. He's in Jack Johnson and James Blunt territory for me. I wonder how Timber Timbre will fair in a festival setting? Look forward to your reviews. Have a blast! This year's incarnation is pretty inventive, if I do say so myself, Al, despite leaving the neckline and the sleeves (which are just rolled up) essentially intact. I figure if it gets really stinking hot, I can always further hack it up later in the weekend. I'm not a particular Michael Franti fan either, but at that time of night, the main stage is the only stage going, so. But yes, I am also really curious to see how Timber Timbre's performance translates from a dark church to a leafy glade. I shall keep you posted! I'm not even sure if you can buy stuff on sticks. The folk fest has really good food! Real food! You should join me, Dr M, there's plenty of room on the olde zombie tarp. You still have time to get here, Lesley, but tickets are selling out, so hurry!